[toc] Hi folks! I’m glad to publish a sixth part of the OpenCV Tutorial cycle. In this post I will describe how to implement interesting non-photorealistic effect that makes image looks like a cartoon. It has numerous names: cartoon filter or simply “toon” also it known as rotoscoping. In addition we will refactor application interface and add tweeting feature to share your results across the web. According to the roadmap I promised to put the video recording module too, but due to lack of free time I decided to put it on hold for now. 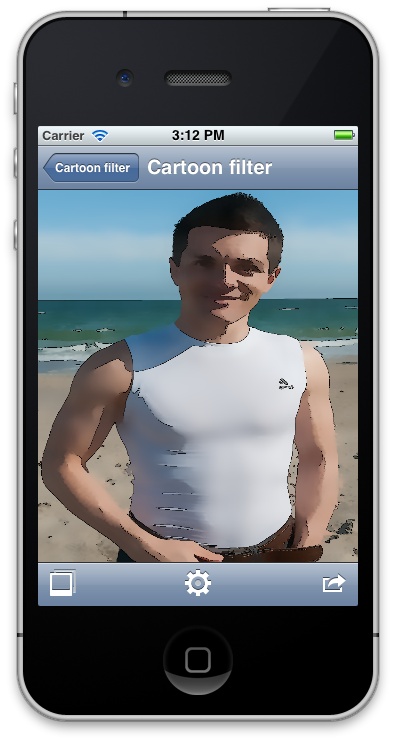 To compensate this in this part I will demonstrate how to get Sepia effect using simple matrix multiplication. Don’t afraid, video recording will be added, but later. I think after part 9, when most of the samples will be optimized using ARM NEON I will add this feature. 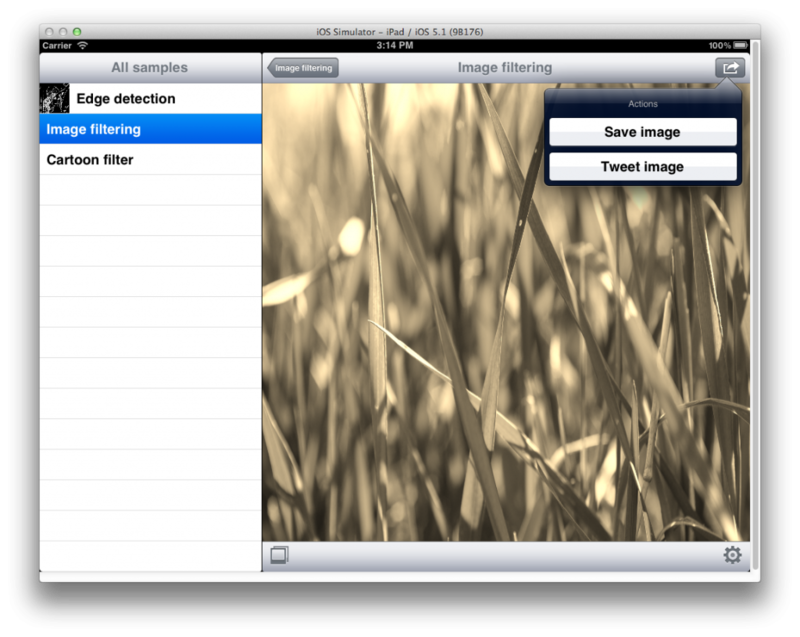 We will consider implementation of the tweetImage and saveImage function a little bit later. BaseSampleViewController has a public readonly property to current sample, and a special setSample function to change it. When a new sample is assigned it calls configureView to update the view title and perform other actions. self.actionSheet = [[UIActionSheet alloc] initWithtitle = @"Actions"
So we pause video source when action sheet appears. To resume processing frames we will use actionSheet:clickedButtonAtIndex method. If clicked button index does not corresponds to known action we simply resume video source because action sheet will be dismissed soon. But if user ask to tweet or save image, we invoke corresponding method and resume video source only after this action is complete. Since tweeting involves presenting tweet compose view it’s reasonable to pause all processing and continue when the all work is done.